Liz Brenner is a singular Duck, a once-in-a-generation athlete that excels in every competition she enters. 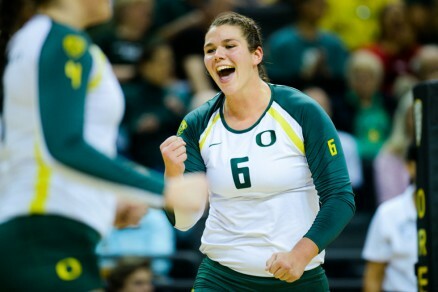 She’s an All-American volleyball player, a 6’1″ outside hitter who led the Pac-12 last year in kills. Not only is she gifted with power and leaping ability, she is so skilled and quick that some are touting her for the libero or defensive specialist position on the US National Team. Brenner, a graduate of Jesuit High School in Portland, has started for the Oregon women’s basketball team, sand volleyball squad and the women’s softball team. She’s also an All-American in track and field, throwing the shot put and she holding the seventh best distance in the javelin for Duck women. Her list of accolades is notable: She was named by the Oregon Sports Awards as the best woman athlete in the state and nationally, she was one of three finalists for the prestigious AAU Sullivan Award which honors America’s best amateur athlete. Catch Brenner and the Duck women’s volleyball team when they play the Bay Area schools this weekend in The Matt. California comes to town Friday at 8 pm and Stanford plays Sunday at 11 am. Your time to watch her compete at Oregon is short; she’s a senior and will be leaving soon. Oregon athletics may miss her, but Duck fans will never forget her passion and her amazingly varied talents.